Hi there, I’ve owned my Sony ICF-SW100S for about a year now and in that time it has demonstrated a level of performance way beyond my expectations. Notwithstanding it’s incredibly small size (about the same as a packet of cigarettes, give-or-take), the DX results I have obtained with it are simply incredible. A fully featured ultra-portable receiver, complete with synchronous detection, selectable side bands, SSB, CW and coupled with sensitivity that has my (wonderful) Sony ICF-SW55 beat – and knocks on the door of the legendary ICF2001D. I simply can’t recommend it highly enough. Plug in some headphones or connect an external speaker such as the Bose SoundLink Mini 2 and you effectively have table-top receiver performance and audio in a very compact package. Originally introduced into the market in 1993 and discontinued in 2005, this little radio covers the broadcast FM band from 76 to 108 MHz and AM from 150 to 29999 kHz, continuously. There are numerous other features that I won’t list here as they’re available on the web, but suffice to say, this (now vintage) ultra-portable DXer’s box of tricks is likely never to be repeated. They are available on eBay and prices remain robust for a radio that will be one to two decades old. Of course there’s also the issue on the first generation models with the ribbon cable connecting the lid of the set with the LCD display etc. to the base, which would fracture after some time, but this was rectified in later models with a notch cut out of the hinge to reduce the stress on the cable – see photo. They are also repairable and in fact I believe Thomas has a posting on here detailing how the ribbon cable on his example was replaced. In my opinion, this receiver is worth the hassle of a repair, because it’s quite simply unique. 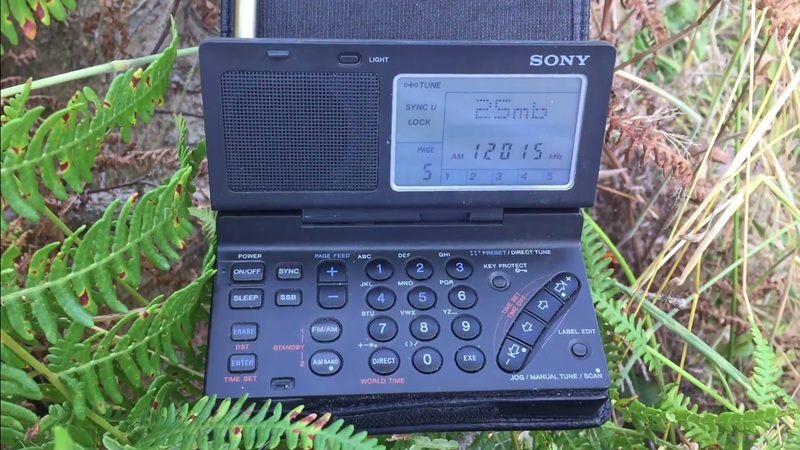 Below are selected reception videos from my youtube channel Oxford Shortwave Log using the Sony ICF-SW100, which I believe epitomise the performance of this great little portable. Thanks for watching/ listening. This entry was posted in DXpeditions, International Broadcasting, Portable Radio, Radios, Shortwave Radio, Shortwave Radio Reviews, Ultralight DX, Uncategorized, Vintage Radio and tagged ABC Northern Territories, ABC Northern Territory Shortwave Services, Bangladesh Betar, DXing, DXpedition, Radio Mosoj Chaski, shortwave, Shortwave portable, Shortwave Radio, Sony, Sony ICF-SW100 Ribbon Cable, Sony ICF-SW100S, Sony SW100, The Voice of Mongolia, Voice of Korea, Voice of Tibet, Zambia NBC, Zanzibar BC on September 20, 2016 by Clint Gouveia. I wonder what has replaced it? CountyComm GP-5/SSB aka Tecsun PL-365? Thanks for the link – I remember seeing that survial post first time around. The Tecsun PL-365 is a great little radio – I have the PL-360 which is essentially the same, minus SSB. However, it’s performance is not in the same league as the ICF-SW100. The Sony has out-performed my Yaesu FRG-8800, ICF-SW55 and Panasonic RF-B65 on a number of occasions. Indeed, I have PL-365 here as well and it performs very well on SSB, the accuracy on the Tecsun is pretty darn good and selectable sidebands on such a small radio is amazing (like the SW07/SW100), for the price though, the Tecsun is a steal. Times have changed since it was introduced and other radios are playing catch at very much reduced prices. This is a very nice SONY radio. But one thing that is interesting is that SONY if your lucky and had no problems you were lucky. You see them often on Ebay and other sites for sale. And they all have 1 of two problems. Either no sound or the key pad does not work. I was lucky the one I have had no problems. The radio also has a very interesting history. It originally started life as a Sangean radio. Sangean never went into production. They only made a few for R&D. You can see them at the Sangean museum in Yonghe. While the radio has the label Made in Japan. It was in reality made in Taiwan by Sangean. Sangean assembled all the components in individual boxes. These were then shipped to Japan where they were then assembled by SONY. This was done to keep the costs down. If you do see one in perfect working order I would suggest you get it. But don’t pay more than 150$. The ICF-SW100 is still my favorite radio. Mine is in mint condition, and to keep it around as long as I am, I bought an extra ribbon cable from Sony. Thanks for sharing these Clint – I am green with envy!! They really are a marvel from everything I have heard. Maybe someday I will get the pleasure of owning one! Thank you Robert, my pleasure and I hope you get hold of one at some point! For the size it works fantastic and MW is decent too. Hi there, I’ve read about the ICF-SW07 and I believe performance is similar or the same as the ICF-SW100. They go for a lot of money on ebay – anywhere from £200 to £500!! Hang on to yours! Hi James, thank you very much and yes I agree, even after all these years, it’s still probably the coolest SW portable ever! A reasonably easy fix for the far-too-strong battery spring is to separate the SW100’s case halves and snip off about 2-1/2 to 3 turns of the hefty, negative terminal battery spring. You’ll need sturdy diagonal or side cutters as the spring wire is fairly thick. After the mod, the pressure on the battery door is greatly reduced and the radio still works fine. I love mine. Sounds great. A few problems though, even without ribbon cable issues. The rubberised coating peels off messily. The battery cover is a terrible design. One small drop and the spring force and inertia flings the batteries out and breaks the thin plastic around the retaining clips. I’m going to need to make an external battery pack for mine since the door won’t stay shut. If you’re lucky enough to have a mint one, treat it carefully! Honestly, Clint? There’s also a cool factor about this radio that’s hard to describe. When I open up my ICF-SW100–whether travelling, camping or even at home–a little part of me feels like a Cold War Spy with a futuristic covert receiver! It’s just icing on the cake that the little rig performs so well! Great post! Absolutely Thomas! I think it’s probably the coolest SW portable of all time and it’s a bonus that it also happens to be one of the best performing! Thanks! Impressive performance, especially the Bangladesh Betar recording. These videos motivate me to connect my recorder and capture some broadcasts. Thank you Troy and nice to know the piece helped motivate you to make some SW recordings! Very nice little piece on this fantastic receiver. SW-100 occupies an interesting narrow band in the collecting community — radios that are NIB or LNIB can still fetch high prices, though they have to be tested to ensure they don’t suffer from being too far off frequency when tuning in USB/LSB. SSB reception is known to suffer from that famous warbling effect, so anyone contemplating getting one of these should not expect absolutely perfect SSB performance, but all in all, this article nicely sums up this wonderful radio. Thank you Dan and yes you’re quite right regarding the SSB warbling, but otherwise a level of performance beyond it’s rather diminutive stature. The big question is why ? There is clearly a demand for a micro SW portable, yet no one has decided to give it a go. What demand? There is very little demand.